Caprice Abowitt — CRISFORD & CO.
Born and raised in Phoenix, AZ, Caprice moved to Seattle, WA to attend Cornish College of the Arts for Dance. After sustaining a disc injury in 2006, Caprice was pointed towards the Seattle yoga community and forever changed. 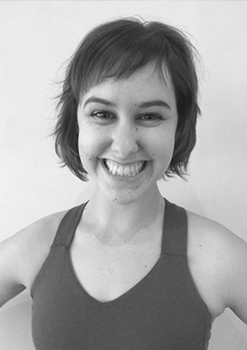 She received her 200-Hour Certification with Catherine Munro of YogaWorks (Seattle) in 2008 and holds a Bachelor of Fine Arts in Dance from Cornish. Additionally, she is a proud graduate of the Prenatal Yoga Center’s Teacher Training program. Caprice developed the children’s yoga programs for Sacred Sounds Yoga, the Seattle Jewish Community Center and PRO Sports Club. Currently, Caprice is working toward becoming a DONA-certified doula. She is thrilled to be supporting women during their childbirth years, in addition to teaching all levels and all ages throughout New York City.